Are you looking for an amazing workout? There is a new innovative machine called the Rowbike. Created by Rollerblade founder and inventor Scott Olson, the Rowbike is giving fitness enthusiasts across the country a unique way to spice up their workout and get outdoors – giving riders twice the workout in half the time. For most American’s – rowing is often something that’s done in a health club or a basement on a stationary rowing machine. With Rowbike, fitness enthusiasts can enjoy the benefits of two of the leading low-impact, high intensity cardiovascular workout that effect a wide range of muscle groups. Seen as an ideal cross training tool, it provides an unmatched upper body workout. 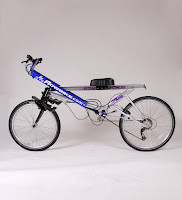 While it may look like a bike, Rowbike is no ordinary bike; its motion comes not from pedaling but from rowing. Rowbike works the upper body, core and lower body all while providing a great cardio workout. Because of the fully adjustable 7-speeds, Rowbike is extremely versatile and can take on significant hills. One of the reasons Rowbike has been recognized as one of the best overall fitness machines is because benefits include muscle strengthening, stretching, improved posture and an amazing calorie burn.